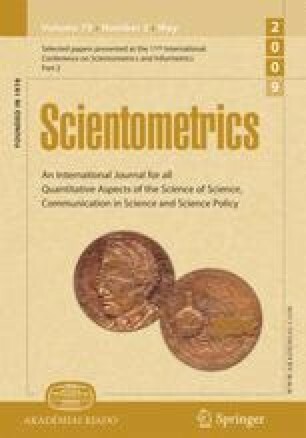 Do new SCI journals have a different national bias? National shares of worldwide publications in the Science Citation Index (SCI) have shifted recently. The long-term decline in U.S. share accelerated in the mid-1990s, and now the EU has joined this decline. Not coincidentally, the shares of some countries have increased sharply, particularly those of China, S. Korea, Taiwan, and Singapore. Since the SCI constantly adds new journals, one reason might be that newly added journals were more favorable to them. To test this, the database was partitioned into “old journals” (added before 1995) and “new journals,” added afterward. The analysis was done for eight of the 20 fields of science defined by the National Science Indicator CD. In some fields, new journals were indeed much more favorable to the Asians. In some fields, however, new journals were actually more favorable to the U.S. In aggregate over the eight fields analyzed, the size of this effect was too small to account for much of the sharp changes in national shares. Furthermore tests between old and new journals find that differences in most fields are not statistically significant. The results provide evidence that the SCI can be used to accurately track national publication changes over time. Testa, J. (2004), The Thomson Scientific Journal Selection Process, 2004. Retrieved from http://scientific.thomson.com/free/essays/selectionofmaterial/journalselection Feb. 28, 2007.